Hohotaro charged towards the spriggan right after he parried the the normal attack of the Spriggan. He would run after the retreating Spriggan ready to use his hook swords to parry the thorn attack. And Hohotaro would attack the spriggan with his elbow and shoulder to push him off the path. If the spriggan tried to summon another hound Hohotaro would use this opportunity to use his elbow and shoulder to attack the spriggan. If the spriggan managed to summon another root hound he would want to attack the root hound as it was being summoned hopefully with a kick. If not Hohotaro would charge at it and use his arms to deflect the bind attack of the hound might use and respond with an attack of his own as a counter. If Hohotaro fails to kill all of the enemies he would shout to Solomon. "Burn them!" After saying this Hohotaro would run away in hopes to outrun the lava Solomon might cast on the ground. They would then continue on following the path to the giant on the other side. Description: Hohotaro raise his arm at 10m/s to chest height with palms forward then move his right foot forward and lowers his stance ready to parry incoming attacks up to C-Tier. Description: Hohotaro raise his Hook swords and concentrate on enemies ready to parry incoming attacks up to B-Tier at 15 m/s. Solomon knew that Hohotaro would be able to handle the sprigan and possible root hound easily, however if he did have a issue with them Solomon would then use Molten Spill once more to help out after removing the sap from his legs. After all the sap is gone and if Hohotaro had successfully kill the spriggan both Solomon and Hohotaro would sprint for the portal as they sprinted for the portal if the King did happen to attack them Solomon would use Onyx Wall to boost himself forward to dodge the attack and get himself to the portal as quick as possible, if he had anything that he could not dodge or that would make him stop his sprint he would then use Weapon Basic Block to defend himself and when in range of the portal he would dive also yelling out to Hohotaro to dive as well, "DIVE BOY!" If anything were to happen where they would have to stop and fight, Solomon would look to Hohotaro and say, "What left do you got? Cuz i'm almost out of juice." Description: Moving his axe at a speed of 20m/s, this move allows him to block or parry attacks 1 A-tier, 2 B-tier, 4 C-tier or 8 D-tier. Appearance: This ring is silver, inlaid with glowing rubies. The face is approximately 1.5 cm tall. The magic circle can be found on the inside of the ring. Molten Spill – By paying 10 magoi, the user may create a pool of lava 10 meters across at 20 m/s within 20 meters of themselves, inflicting C-tier burn damage to anything caught in the pool. Onyx Wall – By paying 10 magoi, the user may create a wall of onyx 5 meters tall and 5 meters wide at 20 m/s within 20 meters of themselves. The fight from the two Imuchakk was going well within their favor so far. Between Solomon King and Hohotaro, the two were doing incredibly well. Showcasing the power of an Imuchakk Warrior who was well used to fighting creatures of the wild that were oftentimes incredibly stronger than themselves, it was as if the men were in their natural element. The Spriggan was indeed summoning a Root Hound with its Nature's Wrath, though it was much closer to Solomon than it was to Hohotaro; on the other side of the man, in fact. Hohotaro successfully struck the Spriggan as it completed its cast, cracking the creature while it flew off of the somewhat narrow pathway. Solomon was successful in creating a pool of lava, destroying the Roothound even as it just finished being summoned into the dungeon. Both hohotaro and Solomon ran across the path to the other side, where the 12 meter giant of a Spriggan stood awaiting them. Immediately upon their approach, things began to fall apart. When they were within 5 meters of the end of the pathway, the creature was already ready for them. It had watched their movements earlier, and began with A King's Truth just as they stepped onto the ground. As soon as the Spriggan king cast this spell, balling up thorns and firing it forward, it prepared another spell; A King's Decree. In Solomon's eyes, the man would see the ball of thorns come forward and respond by dodging it with the help of his Onyx Wall. This shot him forward, into the next spell. A large 4 meter long spear came flying towards Solomon's head, and it took all of his strength to parry it away from him with the Basic Block. Directly behind that spear, as Solomon was recovering, came a 2 meter spear which struck the man's right shoulder, which was already wounded. It was simultaneously at this point when the thorns exploded. The explosion took place just behind the wall that Solomon had erected; even so, the wall was destroyed and Solomon's back was sprayed with thorns from the spell. Pain and exhaustion both assailed the Imuchakk warrior. It was a chore simply placing one foot in front of the other. Hohotaro would not find himself exempt from this destruction. The thorns from the explosion had a large enough range that he, too, would be caught up in it. Furthermore, two 1 meter length spears came shooting towards both his left and right pecs (in the upper chest area). Before them was the Spriggan King, standing at a grand 12 meters in height, the thickness of its two stocky legs together equaled out to approximately 3 meters wide. They would not be able to dive between or beneath its legs, and only had a moment to defend against the remaining attacks. Solomon is currently in a critical stage. Since he prefaced his defensive movements in his prior post, he would not be able to use the same defensive movements in this post (he cannot sustain and use the same abilities he already used for this clash - it is 1 clash. He is welcome to add additional abilities that he has not yet used, if he would like to, in order to work against the B-Tier spear coming his way). He will most certainly take the C-Tier damage to his back and the back of his legs/arms from the Thorn Explosion. The B-Tier damage to his right shoulder is up in the air at this time. Hohotaro: You have C-Tier damage coming towards your back like Solomon did towards his, and 2 C-Tier spears coming towards your chest, each side. The spears are moving at 25 m/s, from the front, and the thorns are moving at 20 m/s from the back. Description: The Root Hound is a mass of roots and vines that is magically energized by an unknown source, and stands at 1.5 meter in height and about 2.3 meters in length. Its eyes glow, making it possible to see even in the dark, and is capable of moving at 12 m/s. The beast has a row of Hawthorne Tree teeth which are capable of C-Tier damage. It has 2 vines which are 1 meter a piece on its neck, acting as C-Tier weapons. Hounding: The Root Hound bounds after its target and uses its teeth to bite away at 15 m/s, inflicting C-Tier damage to its opponent. 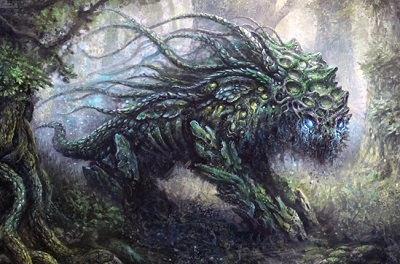 Rooted: The Root Hound shoots out one of its vines at 15 m/s to immobilize an opponent for 3 posts. Description: The Spriggan is a humanoid creature made of magic and wood. 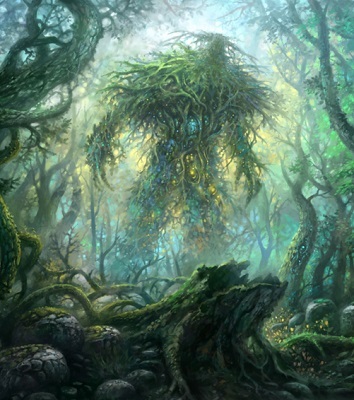 Standing at 2 meters high, the creature seems capable of using magic without a staff. Despite its large size, it is capable of moving at 9 m/s. Being directly struck by this creature, an opponent would be dealt C-Tier damage. One With Nature: A green light fires out of this creatures palm at 20 m/s and pulsates in a 15 meter diameter of the area the light stops at, healing all within the circle for B-Tier damage. 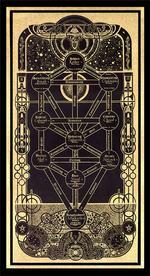 The strength of its magic is beyond normal due to its affinity, and the healing occurs instantaneously. Nature's Wrath: Summons forth a Root Hound at 20m/s. Cooldown: 3 posts. Thorn: The caster fires off a thorn spear, 2 meters in length, towards an opponent at 20 m/s. The thorn deals C-Tier damage and covers 2 limbs in C-Tier sap, immobilizing them for 3 posts. 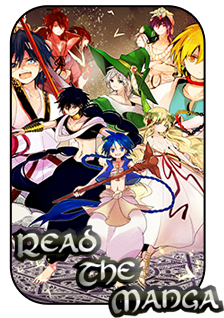 Description: The Spriggan King is a gigantic humanoid creature made of magic and wood. Standing at 12 meters high, the creature seems capable of using magic without a staff. Despite its large size, it is capable of moving at 12 m/s. Being directly struck by this creature, an opponent would be dealt B-Tier damage. The Spriggan King cannot be harmed by Life Magic/Spriggan magic. A King's Decree: The Spriggan King summons forth a round of 4 wooden spears; 2 C-Tier spears, each 1 meter in length with a 20 cm width which tapers off into a point, 1 B-Tier spear that is 2 meters in length with a 40 cm width which tapers off into a point, and 1 A-Tier spear that is 4 meters in length with an 80 cm width which tapers off into a point. The Spriggan King is able to maneuver these spears with strength magic at 25 m/s. A King's Untouchable Might: The Spriggan King enters the lotus position and begins to fly at 10 m/s while 9 rings of thorny vines. varying sequentially from 13-22 meters in diameter, move in a gyroscopic fashion at 20 m/s. These rings are connected by a single vine, and touching any one of these rings would incur B-Tier damage to the individual who touched it. A King's Truth: The Spriggan King opens its palm up, creating a spinning mass of thorns that is 1 meter in diameter. 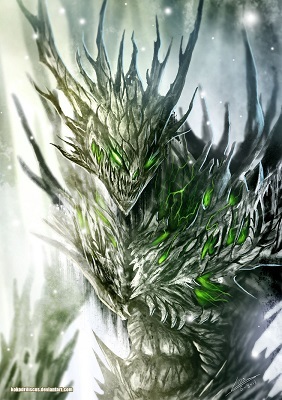 The Spriggan King fires this mass out at 20 m/s and wills it to explode, creating a 10 meter explosion of thorns that deals B-Tier damage to everything in its path. "Mon! Watch out!" Hohotaro spins with his hook sword and surrounds himself with a gust of wind that deflects the 3 spears coming towards them out of the way. Hohotaro bears the impact of the explosion that hit his back taking damage from it. But he doesn't care. It's nothing compared to all the wounds his companion has. Hohotaro looks at Solomon and he looks very exhausted and in pain. Hohotaro lifted Solomon and puts him on his shoulder on a fireman's carry. Even though Solomon is a big guy Hohotaro can still easily carry him due to his Imuchakk strength. Hohotaro slips his hand in between Solomon's legs and held Solomons arm so that his other arm is free to hold his stronger hook sword. "We can already see the finish line. We can do this! Even if I have to carry you to the end. Literally." Hohotaro tries to cheer Solomon up. Even though he's not really sure whether it is really the end. But for them even if it's not the end that awaits them on the other side of the portal they still can't go on any further. Hohotaro then would use his dodging maneuver to dash towards the portal moving through the outer side of the kings legs hoping that the King is still not ready for it's next barrage of attacks. If the King started attacking Solomon and Hohotaro, he would try his best to dodge all incoming attacks as best as he can while still being able to reach the portal. Hohotaro is specially mindful of the large spear that Solomon managed to block. It took all of his power to barely block that attack Hohotaro figure that it's stronger than the spears he managed to deflect by himself. Hohotaro would definitely try dodging that attack if possible. If any attacks cannot be dodged Hohotaro would try to parry the attack with his hook sword. He is also willing to use his hook sword to clash against weaker attacks. If need be, he is even prepared to sacrifice his free left arm to block attacks to protect both his vitals and Solomon. Description: Hohotaro, with his hook swords, spins around at 20m/s, blanketing himself in a gust of wind at a scale of 10m in diameter, parrying up to A-Tier damage. Description: Hohotaro does 4 quick leaps up to 3.75m range at a speed of 20m/s for a total range of 15m in an attempt to dodge incoming attacks. At this point Solomon could feel the pain rattle his body, he could feel the pain of just standing which made him shake, he barely had anything left in him but he would still fight to live, he was not the type to just accept death. He could see that another attack came towards him, but the blood blurred his vision, he knew he would not be able to strike the attack with his axe like he did with the sprigans without chance of missing it. He would then use Basic Block skill stepping to the side of the attack which ended up making Solomon fall backwards as he stepped, only to find himself in Hohotaro's arms. Solomon was to exhausted to be embarrassed and too hurt to complain, he would have to rely on Hohotaro at this point but he knew he at least had one more ability in him he could attempt to use to protect the both of them. Solomon would wait till a opportune moment then he would use Molten Spill directly underneath the Kings feet in a attempt to interrupt any ability he was about to use. Being carried in such a position Hohotaro did Solomon would notice that if Hohotaro were to sacrifice a limb Solomon would then put his axe in the way to class with that attack as a Basic Attack knowing his axe could not handle much more but he would rather that then have a friend lose his arm in protecting him. If Solomon could at that point he would say quietly, "Thank you for not leaving me." Description: Solomon moves his arms or legs at 15 m/s to block plausible blunt attacks of his opponents to stop or parry the attack. This move allows him to block or parry attacks equaling up to 1 B-Tier ability. As Hohotaro began lifting Solomon, the Spriggan King was casting a spell once again; A King's Truth formed within the palm of his hand as Hohotaro shot forward. Each step was a heavy one; the Imuchakk shouldered the burden of carrying another of his kind each time he leaped towards the exit. Passing the creature's leg in a blink, it was only from the corner of their eyes that they would notice the explosion of thorns raining down towards them. Solomon had just leaped his final leap, aiming towards the portal and, hopefully, safety. The two desperately attempted to block the attacks, working hard on keeping themselves from falling prey to the creature who was defending the gate. Due to all the damage you two have taken, and the amount of magoi/stam both of you have spent, the two of you are unable to move/look around for this post. You may post your reaction to the pain/situation, and then your characters will pass out. If you do not want to post a reaction, that is fine as well. Send me (Garret) a PM, and I will post again assuming you guys went to sleep after doing a basic patch-up of each other/yourselves. "Haha.. Mon are you still there? Talk to me buddy." Hohotaro lays on the ground exhausted, all his energy left him as he felt the danger passes. "It was one hell of a ride and we came out battered but still alive. We can proudly say that we have conquered the dungeon. That's a reason to celebrate right? What do you think? Want to do it again? Hahaha" Hohotaro started laughing but grimaced as he feels the pain all over his body. Hohotaro sat up and tended to his wounds and Solomons as best as he can. He can barely see anything as his eyes is covered with blood. Hohotaro takes in a deep breath. He smells the fresh scent of nature. Hohotaro smiles as he hears the streaming water close by, this sound calms him. Hohotaro heard stories about the master of the dungeon. "Hey Mon... Do you know that they say there is a very powerful being here? I really hope that it doesn't see us sleeping here and just kill us. haha..." Hohotaro still manages to joke around while laying on the grass. Hohotaro remembers something. His initial reason to go inside the dungeon was just for treasure. But his journey through the plains and his experience there changed him if just a little. He have another reason to enter the dungeon. He sits up and rummages his pack and pulls out an ornate box. The box contains plans and instructions for farming as well as a pouch of assorted seeds, he got it from the farming tribe in the plains as a gift after he helped them. An image of the burning village and it's massacred people briefly appears in Hohotaro's mind but he quickly pushes it away. He believes that remembering terrible things cannot bring anything good. He focused on the elder and her gift for Hohotaro. He remembered that he was mesmerized by the farms in the plains and noticed its stark contrast with his home village. He had a foolish dream. He dreamed of making a farm in his own village. Everyone around him is saying it's impossible, that his home is not made for farming. But he already knew that, he's not THAT stupid. He knew nothing can grow in it's barren land as it is. Though he still holds on to the dream. He wanted to do something about it and then he learned about the powers inside the dungeon by talking to the people's gossip in the bazaar outside of the gate. When he learned about this he hoped to have asked it for a favor. He dreamed of seeing the golden waves of wheat on the plains be brought to Imuchakk. He would wish to transform the barren and hostile lands into a fertile farm. He hoped that the master of the dungeon would be able to make the seeds he have with him resistant to intense cold and thrive in Imuchakk weather. "I guess I would need to find another path to my dream." Hohotaro muttered under his breath, and smiles still full of optimism. Hohotaro then falls back to the ground and closes his eyes. He has done the best he can, but in this cruel world even a man's best can still be found lacking. This shows Hohotaro that he still have a lot to learn and he still have plenty of room to grow. This experience would push Hohotaro to better himself and to strive for something greater. "Arrhhhggg.... no celebrations, no powerful being he can do what ever he wants just let me rest from the nightmare" Solomon would let out with tremendous pain as he looked into the night sky. He would not even attempt to move as he knew even if he tried he probably would not be able too, nor did he feel like moving, as he stared at the moon in the sky he would say, "I hope its over, just let me sleep I do not care where we are or who is watching I just need to rest." Solomon would not even think of the dungeon as he was in too much pain and too exhausted too, all he would be able to do was to enjoy the peaceful air around him as he stared at the moon and felt the breeze before he willingly allowed his eyes to shut and enter a sleep. At this point everything did not matter to Solomon other then sleep and his body accepted the ground he laid upon to be worthy of that even as a blunt rock dug into his back. All did not seem to be in vain, however; just a few meters away from them was a small pile of gold. The two would be set for their life, if they only spent the minimum necessary to survive. Still, it was a smal fortune. Solomon would find a peculiar item himself; a bracer, engraved with the blessings of nature. If he looked close enough, he would see a magic circle engraved upon the underside of the bracer itself. Should Solomon put it on, it would transform in the most fitting way for Solomon just this once. To the both of you: all dungeon items are supposed to have a cool-down on their abilities. It seems like the Molten items accidentally had them left out. I did not stop Solomon from using it as it was not his oversight, but please put the appropriate cool-downs on any Lava items you have. D-Tier is, of course, 2 posts with C-Tier being 3 and B-Tier being 5 and lastly A-Tier being 7. Normal sustain rules apply to magic items/weapons. Added 50,000 Huang to you both. You managed to make it to the chamber before passing out; Buer sent you a portion of the riches for making it so far (If you would like, reading Solomon Proxy's last post in Merrze's and Ayero's thread will hint at this). 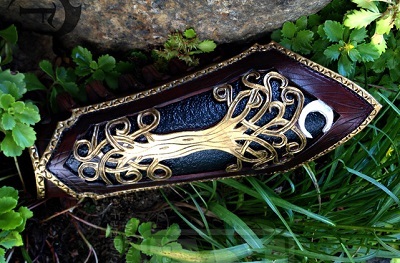 [b]Appearance:[/b] The bracer has intricate leather working depicting a tree in fall; bare of any leaves or fruit. A crescent moon is at the head of the tree, and the night sky seems to dominate the background of this leather bracer. On the opposite side a magical circle has been worked into the leather, showing its capability of channeling the user's magoi into spells. The bracer grows or shrinks depending on the user's arm, creating a form and appearance that is suited to the user (limited time only). [*][b]Nature's Nurture:[/b] Paying 15 magoi, the user's hand and arm becomes wrapped in the power of Life Magic at 20 m/s. The first 4 individuals who come in contact with this heals for B-Tier damage over 3 posts (D-Tier healing in the first two posts, with C-Tier healing in the third). Cool-down: 5 posts. [*][b]Thorn:[/b] Paying 15 magoi, the user fires out a thorn that is created from their palm towards a target at 20 m/s. This thorn is 1 meter in length, and 15 cm in width at its center before tapering off to a point. It deals C-Tier damage, and causes immobilization on 2 limbs for 3 posts as sap from it quickly hardens against a struck opponent. [*]User may register up to 2 B-Tier Life abilities to this item. Hohotaro wakes up his whole body sore. He sat up and looks around seeing the plains around him. "Where are we?" Hohotaro shakes Solomon awake. "Hey Mon. Wake up." Hohotaro tries to think back on what happened. He remembered entering the dungeon but everything else was a little blurry, like when he drank to many rum while traveling with the caravan. Though he noticed that he is now jumpy around trees and have an urge to just burn them to the ground. He really doesn't have an explanation for this feeling but he believes that it have something to do with the dungeon. Hohotaro was bummed that he can't remember clearly his adventures inside the dungeon. What's the point of the experience when he can't even look back on it and learn something. And also he won't have wondrous stories to tell Kirara when he get home. He might just have to make up stories on his own. Hohotaro cannot ignore the nagging feeling that they have failed, though he also feel very light and invigorated. He cannot remember details about the trip but he remembered his feelings during it. He feels joy and excitement for the most part. And he have a renewed motivation for his own personal quest and growth. Hohotaro got up and realized what they were using as bed. "Treasure!!!" Hohotaro exclaimed when he saw gold and gems and other trinkets piled up on the ground. "We're rich Mon! Hahaha!" Hohotaro cannot contain his joy and started to rummage through the pile of riches on the ground. It's a lot of money but for what Hohotaro is planning it's still not enough. The fatigue returned to Hohotaro and he just lay back down on top of the treasure. Hohotaro plays with the thought that if failing gives this much treasure what will they get when they actually succeeded in capturing the dungeon. Hohotaro smiles widely at the thought. "So Mon. What do you think? Do you want to go with me into another dungeon some other time?" Hohotaro grins. Solomon would let out a large sigh as he grabbed his face with both his hands, "Let me dieee" he would say due to the massive migraine he currently suffered from, but shortly after you would see him stumble to his feet body waiving due to the fact he was still half asleep and wished to be that way. He was not over ecstatic as Hohotaro has seemed about the mountain of treasure, even though he was too tired to seem that way he was very happy. With this he knew he would at least be able to start his dream of opening a tavern and creating his own community. "I think that I will follow you for a little while longer, but soon I would like to continue on wards to create my own tavern if you would be willing to follow me for some time." He would say with a smile. As he looked over the pile of gold he noticed something stick out it was a bracer, he picked it up and examined it he would see the bracer has intricate leather working depicting a tree in fall; bare of any leaves or fruit. A crescent moon is at the head of the tree, and the night sky seems to dominate the background of this leather bracer. On the opposite side a magical circle has been worked into the leather, showing its capability of channeling the user's magoi into spells but Solomon did not know much of magic yet other then the ring he currently held. He would look at this bracer that seemed to small at first to put on but as he fiddled with it he noticed that it slowly grew in size to be able to fit around his, and putting it on he would then notice that it would shine a bit brighter then dim down once more and it would remain as he found it. He found this fitting as he did not remember much about the dungeon to him this beauty was enough, and he would not have changed its appearance at all. He would then look too Hohotaro and smile, "Let us take what we can and head out once more" Hohotaro would be able to see the increase of happiness in Solomon that and his new item on his wrist. Appearance: The bracer has intricate leather working depicting a tree in fall; bare of any leaves or fruit. A crescent moon is at the head of the tree, and the night sky seems to dominate the background of this leather bracer. On the opposite side a magical circle has been worked into the leather, showing its capability of channeling the user's magoi into spells. The bracer grows or shrinks depending on the user's arm, creating a form and appearance that is suited to the user (limited time only). Nature's Nurture: Paying 15 magoi, the user's hand and arm becomes wrapped in the power of Life Magic at 20 m/s. The first 4 individuals who come in contact with this heals for B-Tier damage over 3 posts (D-Tier healing in the first two posts, with C-Tier healing in the third). Cool-down: 5 posts. Thorn: Paying 15 magoi, the user fires out a thorn that is created from their palm towards a target at 20 m/s. This thorn is 1 meter in length, and 15 cm in width at its center before tapering off to a point. It deals C-Tier damage, and causes immobilization on 2 limbs for 3 posts as sap from it quickly hardens against a struck opponent. User may register up to 2 B-Tier Life abilities to this item.